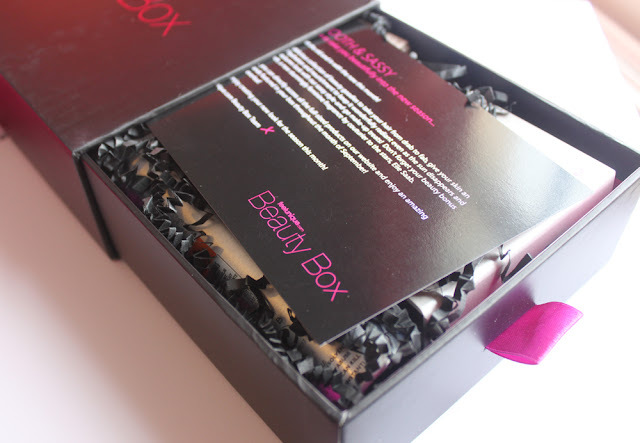 Beauty boxes have created a huge hype on in the beauty blogging world and they most popular seem to be Glossy Box and Boudoir Prive both of which I have reviewed. 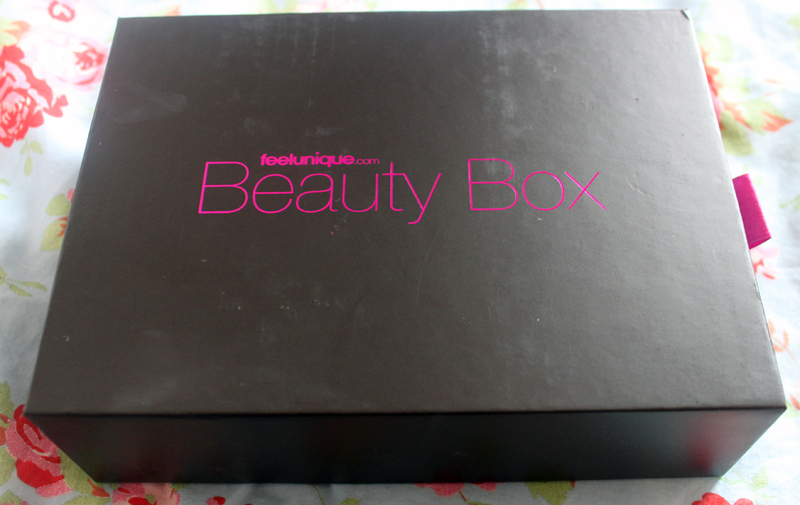 Today I am excited to blog about a box which doesn’t seem to be quite as spoken about but that really excites me and that is the feelunique.com Beauty Box. This post will not only talk about what I think of this box but will also compare it with previous beauty boxes I have received. The first thing I realised as soon as I open the box it was packaged in was that this beauty box seems a little more grown up, unlike the other Beauty Boxes I have tried this is a sleek black one with purple writing and a little ribbon so that you can pull out the draw. If I were to subscribe with these I would love to use the boxes all stacked on top of each other as a little set of sleek black draws. Since the actual box the product come in is slightly smaller it makes the box look far more exciting and full but in fact I think this is a very generous box! You receive two full size products the New CID Picture Perfect Kit which usually retails for over £20 but I can’t actually find this on the website which is a bit of a shame, leading me to think this may have been old stock and also a full size Balm Balm Tea Tree Face Balm worth £6. The box then contains some generous samples the Redkin Hair Spray is sold on feelunique.com for £3.15 and is perfect if you want to try out a new more expensive hairspray or want a hairspray which is the perfect handbag size. My favourite product in the whole box and the one I think I will repurchase is the Di Palomo Wild Fig & Grape Enriching Hand & Nail Cream it smells divine and luckily the sample is a generous size and once again handbag friendly. The other two samples are for Ella Bache Vitamin Radiance Cream which is a quite a pricey cream and you are given 15ml which I actually think is also a decent size amount especially of a luxury brand. The last sample which takes the total content of the box to six (they only say they give five, so this is an extra) is the Elle Saab perfume, this is just the standard perfume size which you can pick up in a department store but it does appear to just be a little extra and I think that the fact it comes in a box makes it a little more acceptable. The theme of this box was Smooth & Sassy and the products are suppose to be 5 steps to make you beautiful in the new season. They also offer 10% off all brands featured in the beauty box on the feelunique.com website which I think is great especially as you can reorder all the products of one website. If I had to chose a Beauty Box this would be the one for me. I love the packaging it is generous in its samples and event a few full size products. 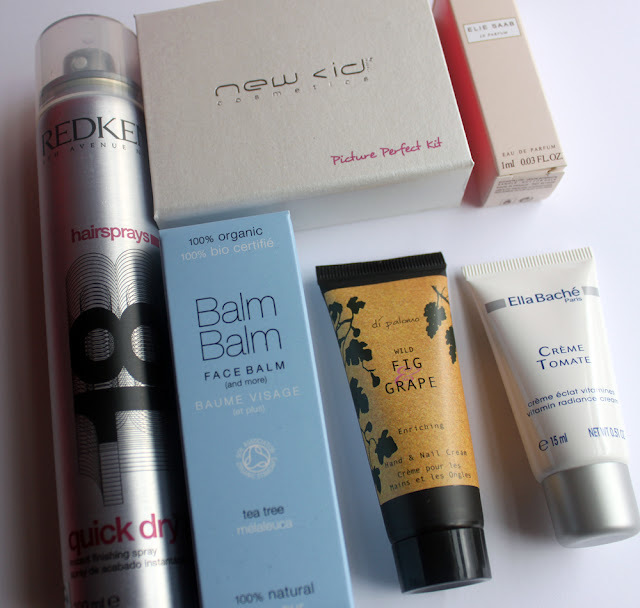 The mix between brands I have previously tired and those I haven’t previously tried has really impressed me and I would repurchase a few of the products. 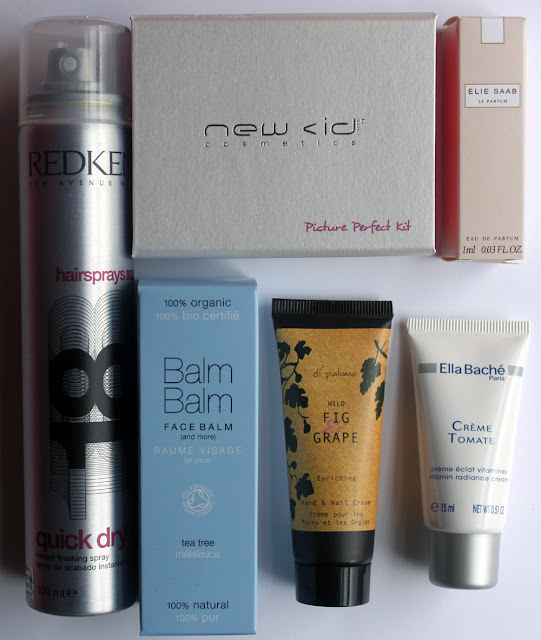 I am still not 100% convinced beauty boxes are for me as I rarely actually products which are actually sample sizes and they never quite included as much makeup as I would like (I would love a makeup box!). Saying that I will be considering subscribing to this box as an experience and to see if this beauty box hype is really for me or not. What do you think of this Beauty Box in comparison to others you have seen? Read Glossy Box & Boudoir Prive Reviews. *Feelunique.com Beauty Box was sent to me for review purposes.